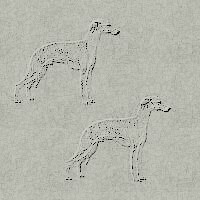 First of all, I would like to thank my whippets Winston and Wesley for their inspiration, if it was not for them, I would not be writing whippet poetry. Also thanks to Blue and Cole, my Heelers, for their inspiration too. Secondly, I would also like to express my gratitude to my good friend Sabine Moosbrugger, who helped create this site. Additionally, I would like to give special thanks to my two good friends Susan Hayes at whippet.com for putting my whippet poetry on her website and for Mary Magee for publishing my whippet poetry in her Whippet Watch Magazine. Lastly, I would like to thank Lorraine Andrusiak of Langley, BC, Canada for the use of her whippet clipart and to Gorgeous Gifs for the creative whippet backgrounds.